Allah intends every facility for you; He does not want to put you to difficulties. Meals are taken before dawn and after sunset, known respectively as suhoor and iftar. At dusk, many gather to break the fast by eating dates and drinking water, following the example of the Prophet Muhammad. 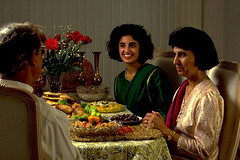 The nights of Ramadan are a time for families and friends, often a festive occasion with special foods. 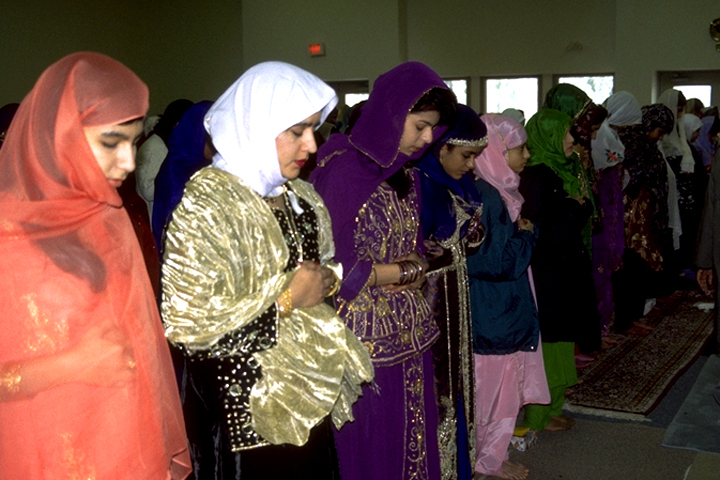 Many mosques (masajid) offer a Qur’anic recitation nightly during Ramadan, such as the Islamic Society of Greater Houston’s Southwest Zone mosque. On Lailat al-Qadr, the “Night of Majesty” on which Muhammad received the first revelation, much of the community gathers in the mosque to listen to the recitation of the Qur’an; many others stay up all night praying and reading the Qur’an at home. At the end of the month of fasting, Muslims gather in large groups to perform the prayers of Eid al-Fitr, the Festival of Fast-breaking. In Atlanta, the imams of ten local masajid gather to coordinate the observance; in Houston, Muslims gather at the George R. Brown Convention Center in Downtown Houston at a celebration organized by the Islamic Society of Greater Houston (ISGH). Some Muslims, in addition to paying the obligatory zakat al-fitr, a special offering for the needy, perform acts of charity throughout the month, and especially on this day. Portland, Oregon’s Muslim Educational Trust coordinates an annual Eid Toy Drive, collecting toys for needy children. Eid al-Fitr is also a time to visit friends and relatives, and many Muslims celebrate with their families for two or three days. Children receive new clothes, jewelry, toys and other gifts, and parents teach the next generation the importance of following the Islamic obligations of fasting, prayer and reading the Qur’an.